Clean and cook boneless chicken pieces as desired or as per this recipe. Then drain the cooked chicken pieces and allow to cool. After that add chicken pieces in a blender and pulse it for few seconds or you chop it finely. Now in a bowl, add shredded chicken, mashed potato, finely chopped onions, capsicum, mint, cilantro, ginger, chicken masala powder, dash of salt and mix everything well. Then add corn flour and breadcrumbs and mix well to a tight dough/mixture. If it is more moisture then add little more corn flour and breadcrumbs and divide the mixture into 12-14 lime sized balls. After that, take one egg in a bowl beat it slightly and keep aside. In another plate add breadcrumbs and in another bowl add flour and ground pepper, mix well and keep ready. Now take one ball, dust in flour-pepper mix, then dip in egg and finally roll in breadcrumbs until the ball is well coated with breadcrumbs. Then flatten it to a tikki and again roll in breadcrumbs and keep aside. Do repeat the same for all balls and keep aside. 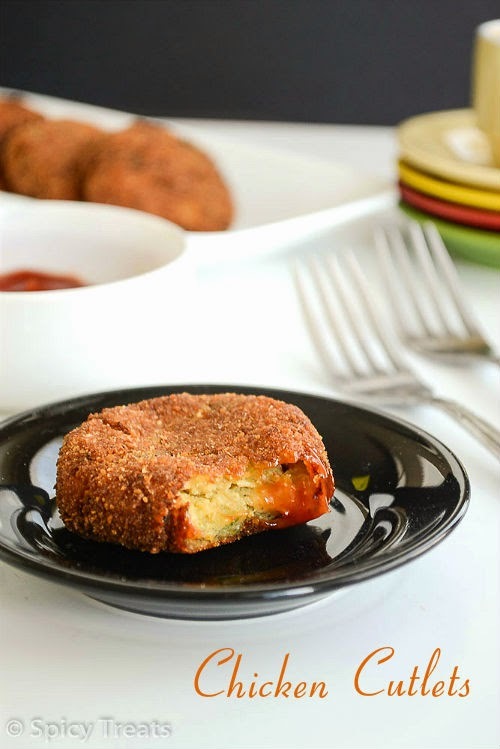 Heat oil in a kadai to deep fry, when the oil is hot, add 2-3 cutlets at a time based on the size of the kadai. Fry in medium high heat till both the sides turn nice golden brown and crisp. Once done remove it using slotted spatula and drain it in paper towel. 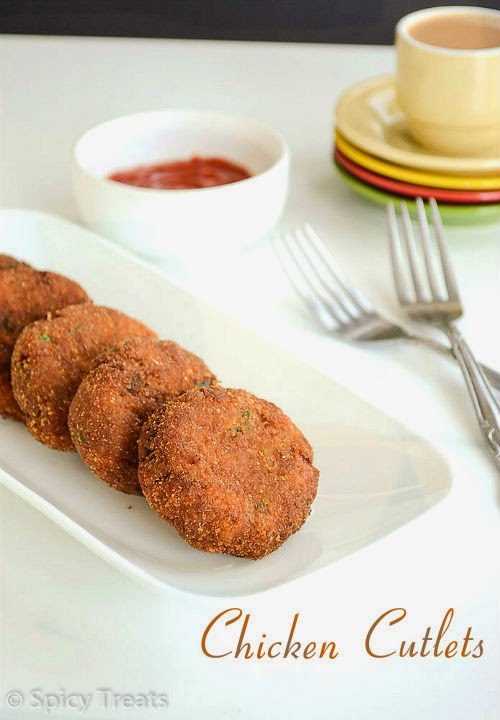 You can also toast it in tawa/griddle, heat a tawa smear it with oil and arrange the tikkis and cook in medium heat for 3 minutes and flip other side and cook till it is done. 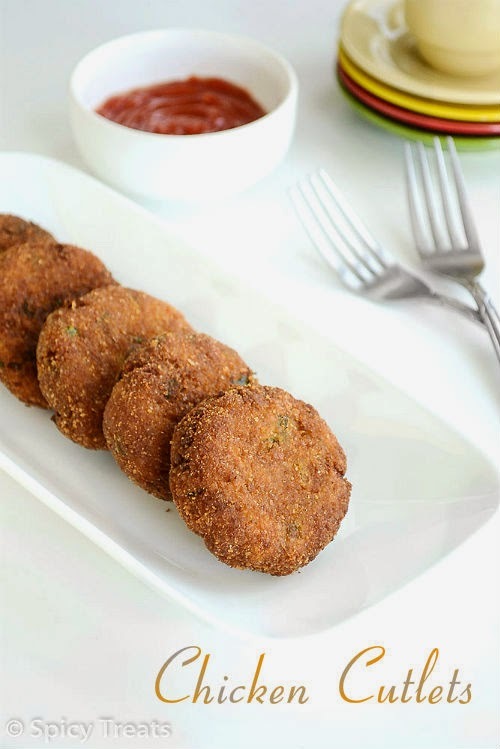 Then serve the yummy Chicken cutlets with ketchup or green chutney or any desired sauce. You can use any kind of cooked chicken, i haven't tried with raw minced chicken so not sure about the taste. You can also add some finely chopped green chillies are extra spiciness. Add more or less mashed potato, if the mixture has more moisture adjust it with corn flour or breadcrumbs. Oil should be hot but not smoking hot, if it is smoking hot then the outer breadcrumbs with burnt quickly and inner part will not be cooked properly. At the same time, if you add in less hot or no hot oil, the cutlets absorbs more oil, and will be soggy. 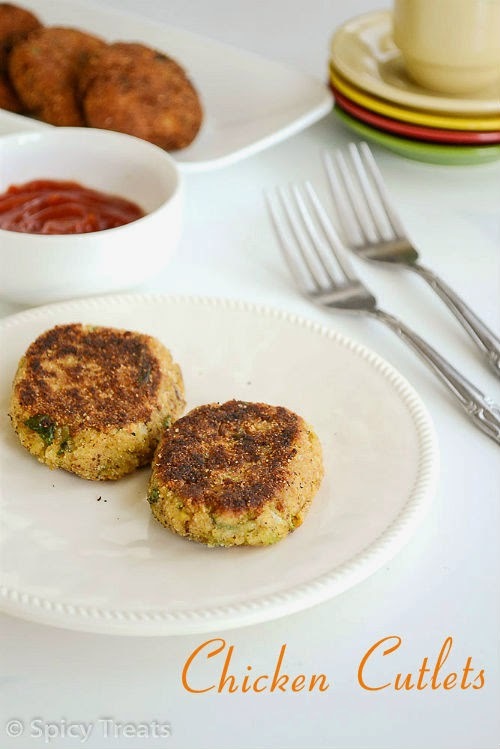 Perfectly made chicken cutlet and tikkis . The platter looks inviting sangee..
Will the chicken gets binded wjth potato? And since its already cooked wint the shredded chicken turn iut hard when fried again? 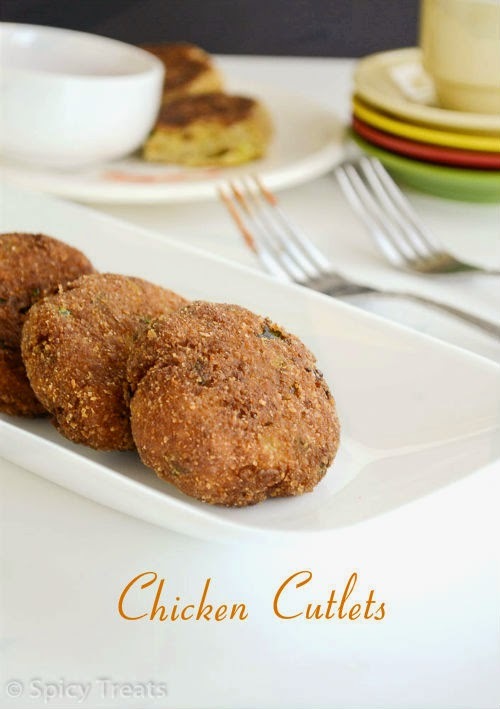 Yes...since the chicken is pulsed, it easily mixed with the potato and with the moisture from the onion n capsicum..patties were soft and tasty...it wasn't dry/hard. The potato-chicken mixture looks stiff but it was delicate to handle because of over boiled potato(gold potatoes)...somehow i managed to fry few cutlets!! My mouth is watering here, i want some to have rite now. Perfect tikkis... love to have it in a burger!!! Pls tell me can you freeze these or will they become soggy due to the potatoes? 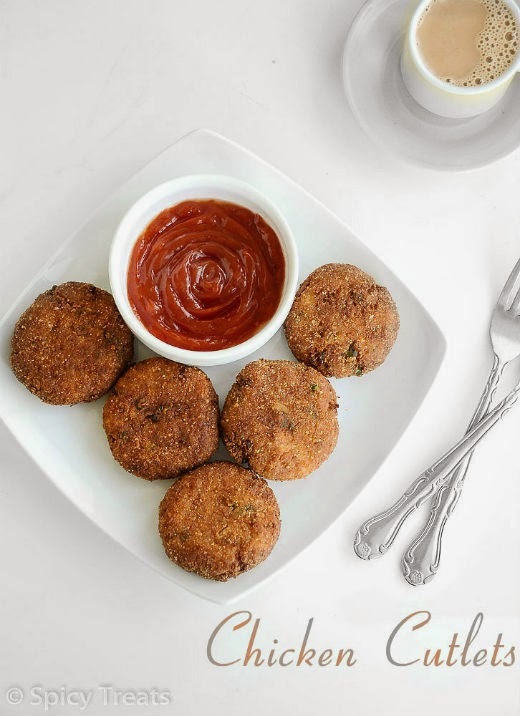 Superbbbb cutlets.....thankuuu for d yummy snack..